Now I write an impression about my ThinkPad 701C. Butterfly is in this box. ThinkPad is tightly protected by large urethane. In the box, there is a big sheet that called "Product map". You can check whether there is any missing item by using it. 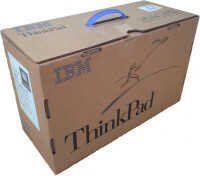 ThinkPad 701C has characteristic in a large display which filled box and protruded keyboard. Color LCD was expensive in those days. Low-priced DSTN color LCD was existed, but I selected a TFT color LCD. If only the resolution has been a little large (800x600 pixels or more). 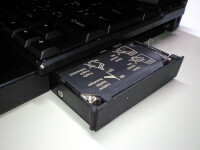 When the display is closed, the keyboard is stored into a body and become compact. Although some interfaces are in the side, its design is very smart. I felt tgat the surface is moist rather than smooth. On top of diplay, latches exist. The small dots are screwhead. You can open this screw by using TORX T1 screwdriver. On left side, power jack, power switch, parallel/diskette drive connector, modem and audio jack exist. On right side, battery pack, hard disk drive, PCMCIA access port and Kensington slot exist. When the docking door is opened, we can see the system expansion connector. 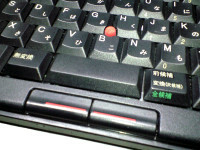 One of characteristic point of ThinkPad 701C is its keyboard. A key pitch is 19mm. This key isn't small, so it's easy to use and is comfortable. But a key touch is soft for me, and isn't my liking. And when we are punching keys at both ends, the keyboard is bent a little. ThinkPad 701C has the TrackPoint as a pointing device. Touchpad device is major now. But I choice the TrackPoint because it need not off my hands from a keyboard. The CPU is DX4 75MHz, the memory size is 24MB (after adding). It had sufficient power at the time. Hard disk drive is removable. I replaced to 2.1GB hard disk drive later. 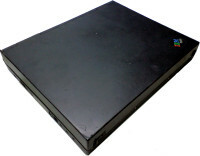 I used a disk case that called ThinkPak. The capacity of NiMH battery is 2,000mAh. Although I had few opportunity using it by only battery, I didn't feel that battery capacity is short. 10 years or more have passed, an inner substance is leaking out now. This connector cover is hard rubber and difficult to open/close. When the keyboard is expanded, we are difficult to access it because this connector is hidden by keyboard. Buttons for ejecting are in the inner part. So it's difficult to take out inserted PC cards. 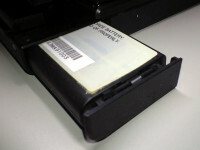 The power switch is beside the parallel/Diskette drive connector. At the beginning, a spring of the power switch was hard. But, it becomes soft while using it.